It was a national championship game that had a little bit of everything – ups and downs, intrigue, adversity, and heartbreak among many other things. 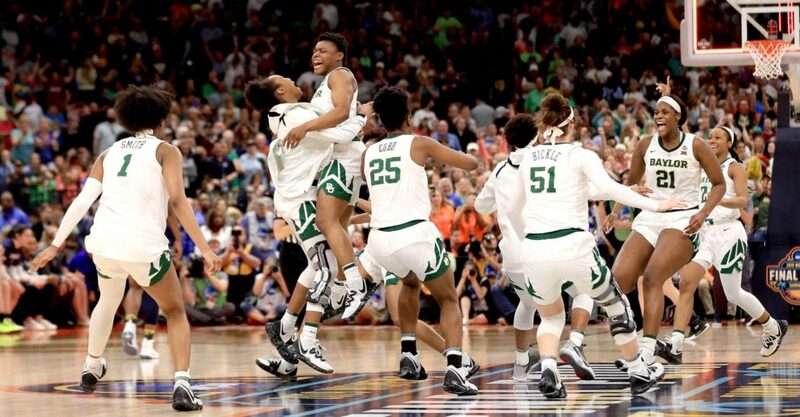 When all was said and done, Kim Mulkey’s Baylor Bears denied Notre Dame a repeat of last year as they defeated Muffet McGraw’s Fighting Irish by a final of 82-81 to claim the 2019 national championship. It is Baylor’s third national title in their history. The crowd at Amalie Arena was a sellout crowd, so add another one for those who love to vociferously claim that “no one” cares about women’s basketball or women’s sports in general. Lauren Cox became a story of the game – albeit for all the wrong reasons. A gruesome knee injury she had in the latter portions of the contest sidelined her for its remainder. Baylor had built up a 17-point lead – one that Notre Dame managed to trim down and erase completely with Cox not on the floor. For a period of time, it appeared as if the injury to Cox had mentally rattled the Bears as the Fighting Irish went on a ferocious tear to get back in the game. Cox’s injury had on-court effects as well. Throughout much of the first half, Notre Dame, a team that likes to execute its transition offense, had trouble doing so with Cox and Kalani Brown patrolling the paint. The Bears had a 43-31 lead at halftime. Cox only had eight points, but hauled in eight rebounds and also had three blocked shots, so her presence did not require her to score more than what she had to. Two made layups by Jessica Shepard with 17 seconds remaining tied the contest up at 80. Then down came Baylor’s Chloe Jackson who had iso defense played against her by the Irish. A screen was set and she drove to the hoop for the go-ahead basket to make it an 82-80 game. Arike Ogunbowale, who was the hero twice for Notre Dame in last year’s Final Four, had a chance to do so again, but this time from the free throw line as she was fouled with two seconds remaining on the clock. But Ogunbowale missed her first try, then made her second. That first miss practically put the game on ice for Baylor and a celebration began to ensue for the Bears that stretched from Tampa all the way back in Waco. Even though Ogunbowale was emotional after the game – and rightfully so (any athlete would feel this way), she, in large part, kept hope alive in South Bend. Without her 31 points and six rebounds, the game may have been long over with or without Cox’s ugly injury. Marina Mabrey scored 21, Brianna Turner added 12 points and 12 rebounds and Shepard finished with 11 points and 10 rebounds. For Baylor, Kalani Brown scored 20 points and hauled in 13 rebounds, but Jackson, who was named Most Outstanding Player of the Final Four, had 26 points. NaLyssa Smith also contributed 14 off the bench. What a season. What a game.